I am delighted to announce that my book “Painting with Pastels” which had been out of print for a few months has now been re-issued in a new edition entitled “Start to Paint with Pastels“. Painting with Pastels received some great reviews on Amazon and Artbookreview.net. but one of the few criticisms – that some of the step by step images were too small to see in detail – has been addressed in this new edition by adding 16 more pages and enlarging many of the stages. Students will really benefit from the colour chart which now shows the precise colour references. 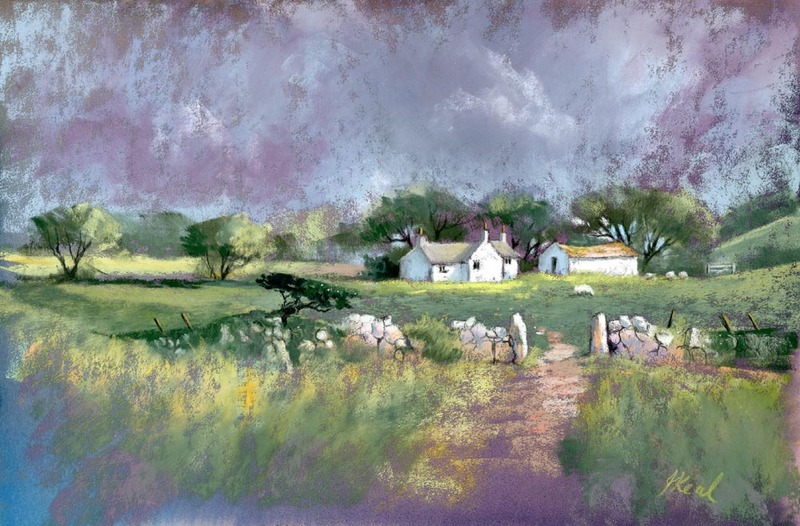 Start to Paint with Pastels brings you a wide range of landscapes with a strong emphasis on creating interesting moods and lighting effects. It is more than just a guide to producing a copy of what is in front of you, or a photograph. Injecting strong colours really makes your paintings sing and you will learn a lot more methods to improve your paintings from these pages. You will also find many useful tips on painting flowers. 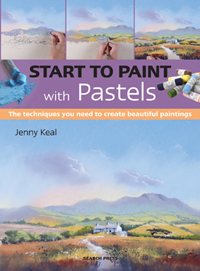 If you are starting with pastel or feel you need to refresh your skills you will find this new book will inspire you try a range of exciting techniques for painting landscapes and flowers in pastel. Sometimes it is a good idea to take a completely different approach to a painting. I normally start by painting the sky, background hills and trees and then painting the focal point, finishing with the foreground. There are practical reasons for this, as it is easy to smudge a focal point that you are pleased with when painting the area above it. 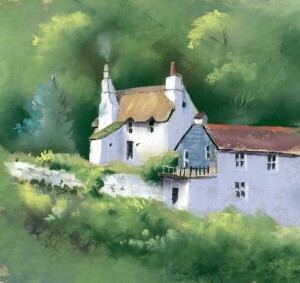 However, in the case of the painting illustrated here, a cottage in the Preseli hills, Pembrokshire, I began with the focal point, then painted the sky and trees ending with the foreground. The surface I am using is Fisher 400 art paper which has been tinted with a purple ink wash. This gave me a dark background and allowed me to leave some of the surface unpainted giving a unity to the work. By adopting this order of working I found myself working in a much looser way, for example adding the light between the branches of the trees instead of the other way around, and painting the trees around the buildings rather than painting the building over the trees. So experiment with your approach to a painting and see what happens. I will be running a Pastel Workshop in the White Horse Bookshop in Marlborough on 4th August, 2016. If you are interested in enrolling please contact Edwina Pearce on 01672 512071.at the White Horse Bookshop in Marlborough. 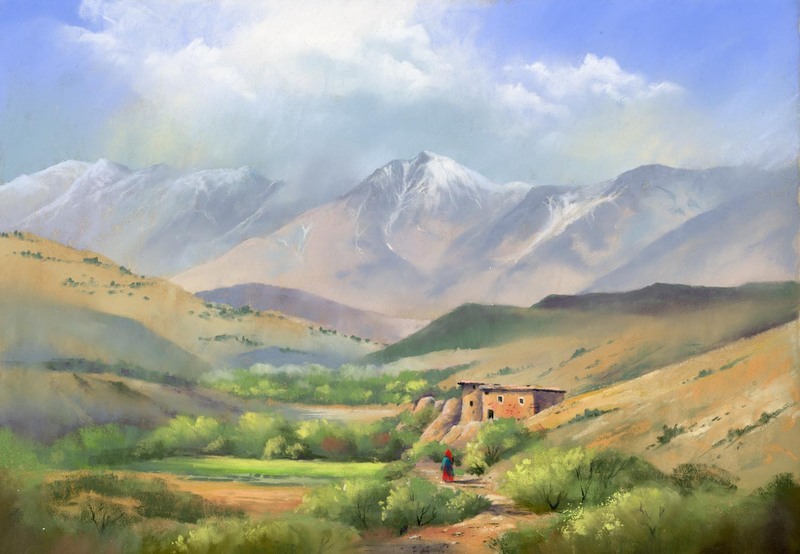 Learning how to create atmosphere and recession in a landscape painting is an essential skill for a landscape artist. 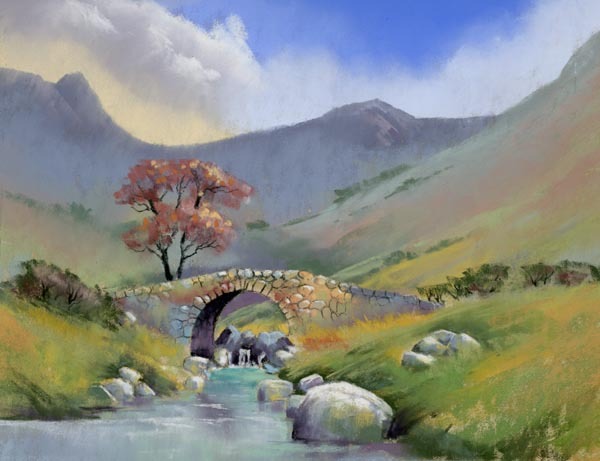 Artists will have their own techniques to achieve this effect but in my new DVD Pastel Demonstration Lingcove Bridge, I explain my methods. I like to give a painting a sense of space and a strong feeling of atmosphere. Atmosphere is something that becomes easier to understand if you sketch outdoors, in front of your subject. 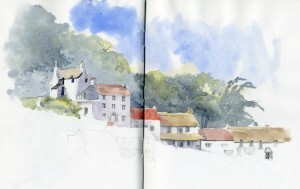 There is nothing like getting out in the countryside to give authenticity to your landscape paintings. These are not new ideas, the old masters excelled at giving a sense of depth through these methods. You almost certainly have heard these tips before, but it can’t be said too often. My entry for the Cox & Kings competition is finished.The final stage of any painting is a dangerous time. The temptation to put in every detail is great but it must be resisted. In the photograph which I posted on 28th October, (you can see this if you scroll back through my blog) there were a lot of trees and bushes so these have to be simplified. 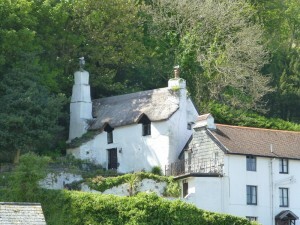 Also the hillsides were dotted with scrubby bushes but to include all of those would be spotty and distracting. There was no obvious pathway leading the eye into the painting so I created one that led towards my focal point, the building. I had moved the building closer to the wadi so that it fell in a more pleasing location, directly below the main peak of the mountain and within the Golden Section. The strongest tonal contrast is on the building and I have added a figure, a Berber woman in bright clothing which I had found in my 1993 Morocco sketchbook. I have thoroughly enjoyed this exercise and I want to thank Katie Parsons of Cox and Kings for inviting me to take part. It was the incentive I needed to get painting again after a long absence. I wish my fellow competitors good luck.